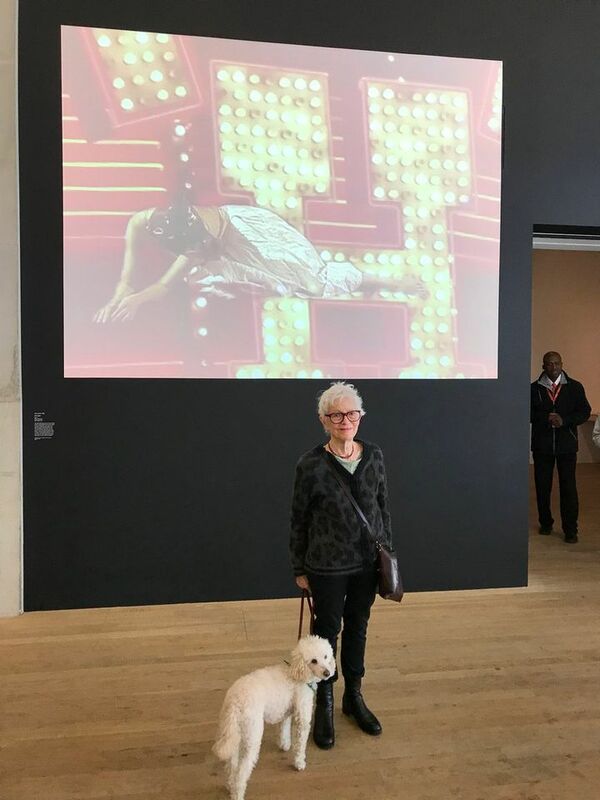 Joan Jonas and her poodle Ozu reigned supreme at Tate Modern all last week, presiding over the various openings of her kaleidoscopic, multilayered survey, which haunts, discombobulates and enthrals in equal measure. He was at her side for all the walk-throughs and many of the interviews and accompanied her onto the podium on opening day (13 March) as she dedicated her show to the children of America taking to the streets in protest against gun violence. Ozu also had a seat in the front row and interjected with the occasional whimper as on Friday (16mMarch) Jonas and the jazz pianist and composer Jason Moran kicked off a week of live performances with a rich immersion in their twelve year collaboration entitled Working Together: A Lecture-Demonstration. With Moran at the Steinway grand providing a gloriously varied improvised live sound track, Jonas took us through what she described as “quotes” from the works they have done together, linked with many affectionate exchanges between the two. Once that had been established, all of the above were brought into play with a vengeance. Spurred by Moran’s playing and against a constantly changing projected backdrop, Jonas reprised earlier pieces with nimbleness, force and energy that belied her 82 years. She revisited her memory of witnessing Hopi Snake dances with the vigorous splashing of a giant white serpent onto the floor in white paint; she artfully crumpled a sheet of paper into fragments, and, to the surging sound of Moran’s piano, activated a whole smorgasbord of instruments including bells, horns and a bird cheeper. At one point she performed a comic turn, sashaying to Moran’s Stride Music whilst dragging away a painted work. Other former collaborators joined in too: Canadian musician Kate Fenner stepped up to perform a haunting live rendition of Woody Guthrie’s Path of Plenty as part of Jonas revisiting the 2005 The Shape, the scent, the Feel of things. Another memorable moment was when Lila, one of the child-performers who traced the passage of bees in They Come to Us Without a Word, came up from the audience and sat to one side for a chunk of the second half, meticulously ravelling and unraveling a ball of wool. As the evening unfolded in all its different manifestations, it felt less like a lecture demonstration and more like a unique family reunion, presided over by an exceptional matriarch with ringside support from her canine sidekick.